BRAINERD, Minn. - Lindy Little Joe has introduced a new weed-defying jig to complement their leading NO-SNAGG line. Manufactured from a design by Greg Bohn and incorporating Lindy's patented NO-SNAGG seven-strand wire guard, the VEG-E-JIG offers 95 percent snag-free operation in heavy vegetation, a prime feeding ground for walleye, northern pike and bass. The VEG-E-JIG features a slender profile that allows the jig to slice through weeds and maintain contact with the bottom. 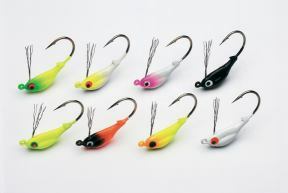 It also features a Gamakatsu premium hook, making the jig ideal for live or artificial bait. The jig features an adjustable weed guard to allow snag-free fishing in a variety of conditions. According to Ted Takasaki, president of Lindy Little Joe, The VEG-E-JIG is designed to catch fish, not snags. For more information on the VEG-E-JIG or other Lindy Little Joe products, call 218-829-1714 or visit www.lindylittlejoe.com. Known as a leading freshwater tackle company, Lindy Little Joe, Inc. is credited with developing many of the freshwater lures and methods that dominate the industry today. The company also offers a complete line of market-leading terminal fishing tackle: NO-SNAGG sinkers, jigs, rigs, floats and accessories including name brands such as Lindy Little Joe, Thill and System Tackle.